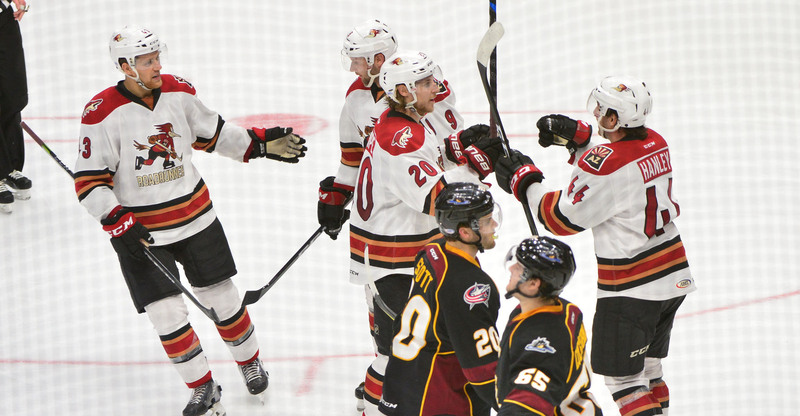 On what proved to be a historic evening, the Roadrunners flew past the Cleveland Monsters in the club’s first-ever visit to Northeast Ohio, winning 5-1 Friday night at Quicken Loans Arena. Carter Camper and Jordan Maletta, both acquired prior to Monday’s trade deadline, made their Tucson debuts against their former team, and in their former home building. And for Camper, what a homecoming it was. He finished the night with five assists, having a direct hand in all five of the Roadrunners’ goals - becoming the first player in franchise history to register five points in a single game. Mario Kempe registered his first-career hat trick, the third in club history. Trevor Murphy, who was skating in his second game with the Roadrunners, opened the scoring just over six minutes into the contest, corralling a Carter Camper pass as he joined a rush, and gained favorable position toward the net to beat Cleveland’s Jeff Zatkoff. Murphy’s goal was his first in a Roadrunners uniform. Cleveland’s Jordan Schroeder tied the game 1-1 later in the opening frame. In the second period, the Roadrunners erupted for four goals in a 6:29 minute span. During a scramble amidst traffic in front of Cleveland’s net just over seven minutes into the middle frame, an errant puck caromed off of Mario Kempe and into the back of the net to give the Roadrunners a 2-1 lead. Less than a minute later, Kempe redirected a Dakota Mermis shot home for his second goal of the evening, giving the Roadrunners a 3-1 lead as he skated across the slot to disrupt Zatkoff’s vision. Just past the midway point of the second, Kempe hit Michael Bunting with a stretch pass in stride in the neutral zone. Bunting, with space, fled into Cleveland territory and fired a wrist shot to the far side for his 15th goal of the season, giving the Roadrunners a 4-1 lead. Cleveland’s Jeff Zatkoff was pulled for Matiss Kivlenieks following Bunting’s goal. With 6:19 left to play in the second, Kempe received a cross-slot pass from Carter Camper, and with ample time and space, beat Kivlenieks for his third goal of the game, registering the third hat-trick in Roadrunners history. Adin Hill stopped 24 of the 25 shots he faced to earn his 14th win of the season. He has won five of his last six starts, and has not dropped a decision in regulation since January 27. 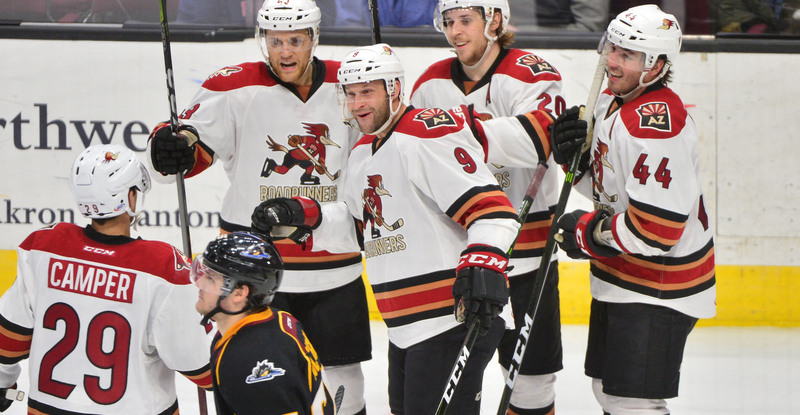 The Roadrunners will complete their three-game road trip Sunday afternoon when they take on the Cleveland Monsters at Quicken Loans Arena, where the puck is scheduled to drop just after 1:00 PM MST.